Michael Madigan has served as chairman of the Illinois Democratic Party for 20 years (prior to that, he was Speaker of the Illinois House for decades); if you donated to the party in Illinois, Mr Madigan used your money to fund mailers that smeared progressive Democratic hopefuls as being secret Tea Party members, Donald Trump supporters and opponents of universal health care. Among those targeted by Madigan are Elizabeth Lindquist and Art Bardsley, running for seats on the State Central Democratic Committee with the backing of Our Revolution, whose platform includes universal health care, ending gerrymandering, campaign finance reform, and other anti-corruption, pro-worker measures. 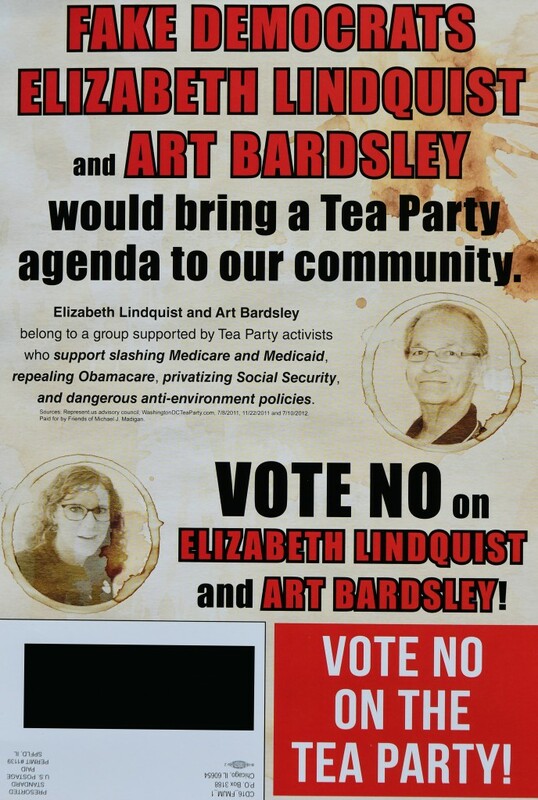 According to Madigan's mailer, these two are actually "members of a group supported by Tea Party activists" who advocate "slashing Medicare and Medicaid, repealing Obamacare, privatizing Social Security, and dangerous anti-environment policies." In reality, Lindquist is publicly opposed to cuts to social programs, including all those named in Madigan's mailer; Bardsley is running on a platform of renewable energy, free state colleges, and preserving natural habitats. Madigan targeted several other progressive Democrats in Illinois -- including those standing in races where there are no other Democratic candidates, who represent the only alternative to a Republican incumbent. This is why you shouldn't give a dime to establishment Democratic organizations (donate to Our Revolution instead, and support progressive Democrats). Madigan's office has been wracked by a series of sexual assault scandals that he has failed to take action on. Many Democrats have called for his resignation. Madigan’s committee also sent out mailers in the race for Illinois’ 5th District, favoring incumbent Cynthia Santos over Melissa Lindberg, the chair of Democracy For America’s Chapter in Northside Chicago. The mailers portray Santos as a candidate who stands up to Republican Gov. Bruce Rauner, who, in fact, appointed Santos to the State Pollution Control Board in 2016. Santos served as an elected commissioner of Metropolitan Water Reclamation District of Greater Chicago since 1996, before leaving the position to serve in Rauner’s administration, and was first elected to the State Central Committee in 2000.